Now that the season has begun, official visits are being scheduled by high school football players across the nation. Recruiting’s most active part of the year is under way! In my last article, found here, I talk about the future changes that can be expected on the defensive side of the ball. This article is Part II of the two-part series of faces that could change for Oregon’s recruiting class through signing day in February. Tyree Robinson enjoying the fans – and vice versa. Tre’ McKitty is the offensive version of Rutger Reitmaier from the Southeastern part of the country. This tight end totes the most offers at that position and attends the powerhouse IMG Academy in Florida. His commitment to Oregon is huge at all levels. 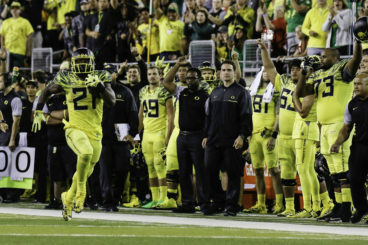 A recent update by Justin Hopkins at Duck Territory, however, hints that McKitty’s commitment isn’t as solid as hoped. It seems that the parents may have mixed reviews regarding the distance. Hopkins’ counterpart, Matt Prehm, believes McKitty’s mom loved the Eugene visit but his father is not fond of missing games. This may be a long road to signing day with this great talent that Oregon definitely needs. Offensively, Oregon does really well at the skill positions. Only two known offers have gone out to quarterbacks. One de-committed from Oregon months ago and will not reverse his decision. The other is committed to Alabama. If a quarterback is not taken in this cycle, I will not be worried at all. The three young guys on campus now are more than capable of developing into very talented QB’s. Also, the 2018 QB that is committed, Colson Yankoff, is already a superstar with two more years of high school to go. Coach Gary Campbell is arguably the best running backs coach in the business. His eye for elite backs is unprecedented, and the development process is mind blowing. CJ Verdell is the only committed running back and only six other known offers have gone out. The state of Oklahoma plucked two of them and the No. 1 player in the nation, Najee Harris, is firmly committed to Alabama. It is rumored that Harris begs for competition. Well, position-wise, Harris will definitely have competition at Alabama, or if he stays closer to home, at USC. However, playing time at ‘Bama is where the competition ends because the offensive line in Tuscaloosa annually is NFL-ready playing against college athletes, busting huge holes for the RBs. How challenging is that? Competition? Please. Royce Freeman has power and speed. It’s okay if Harris doesn’t want to look as good as Royce Freeman because I love the possible get out of Florida with another underrated RB. Darrian Felix wants to make the West his home. The Miami Hurricanes are trying their hardest to keep him in state, but Felix would make a nice fit running with Verdell. Felix has set his official visit date for the Huskies game October 8th. I will not be ashamed bringing in these two 3-star preps. As both are very underrated. Defenses would do well not to sleep on these two. Two more running backs have recently been offered. The first is 3-star JUCO back out of New York, Krysten Hammon. Hammon must be overwhelmingly underrated because Campbell has not tried to reach from the JUCO ranks since Serge Trezy in 2014 and LaGarrette Blount in 2008. The second is Travis Etienne out of Louisiana. This high 3-star stud says that Oregon is his dream school and runs similar to ex-Duck Jonathan Stewart. The potential to get Etienne and Felix is likely and Campbell may want to snag all three, including Verdell, to make up for missing on all RBs in the 2015 class. Tight end is a position that is currently full at two commits. As stated earlier, McKitty will be tough to keep for another six months. Even if McKitty stays, I can see Oregon still shooting for only one more particular TE in this class, Josh Falo. Falo is at the top of the TE board for Oregon. He’s one you don’t refuse with his versatility and athleticism. Falo is also a teammate with defensive back, Trajon Cotton, and getting a two-for-one would be ideal. He’s back! Pharaoh Brown for a TD. Wide receiver is wide open. 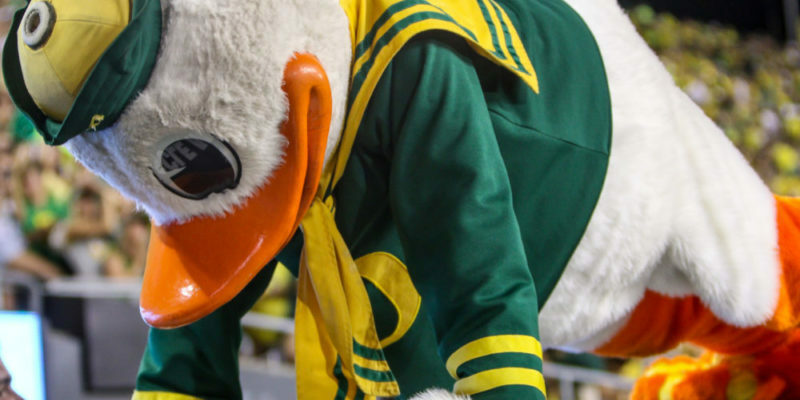 With 23 known offers on the board, Oregon is uncharacteristically struggling at this position. 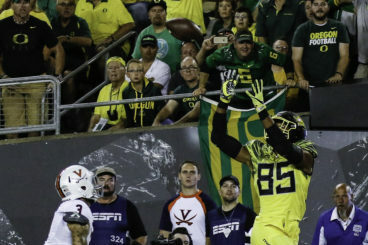 Do WRs watch Oregon’s offense? Sure the offense is run first, but there are so many huge plays off the pass because of the run. Four guys with WR height who have not committed yet are Oliver Martin, Chad Terrell, Jeremiah Holloman and Joseph Lewis. Lewis would be huge but seems to favor USC and staying close to home. Martin could be a tough pull from the Midwest having Michigan and Michigan State holding on tight. Terrell has already visited Oregon for an official and it seems the visit went well. Holloman is another Southern stud that would have to decide the cross country trip from Georgia would be worth it. None of them appear to be really high on the Ducks, but Martin is the closest to potentially choosing Oregon. Two more receivers that just make plays despite their size are “Mr. Do Everything,” Tyjon Lindsey and “Pure Speed,” KJ Hamler. Hamler is another IMG guy that explodes with quickness and who catches everything. Lindsey, who recently committed to Ohio State, is known to communicate with ex-Ducks superstar, DeAnthony Thomas. Lindsey liked Oregon early in his recruitment. What cooled him off from Oregon can be speculative. Was it that Oregon did not offer his Bishop Gorman QB and close friend Tate Martell? Maybe Thomas’ influence isn’t as strong as I would hope it would be. Lindsey knows how well Thomas did in the offense at Oregon and knows that he would have a very similar experience, but it appears, for now, that Martell is the key. Offensive guard is easy this year. Only one of three prospects remain. Casey Roddick is a 3-star that really likes Oregon. It’s likely to see him in Eugene a year from now. Nick Brahms spoke of three schools of high interest for a long time. He favored North Carolina, Tennessee and Oregon, then he committed to Auburn out of the blue. The improbable catch by Devon Allen. The 2017 class could be very good to Oregon at tackle. There are so many talented OT’s on the west coast, and the Ducks want to gain solid depth on this side of the line. Two at the top of the list are a couple of my favorites in this whole class - Foster Sarell and Austin Jackson. Both being 5-stars, Sarell is just a little closer to U of O campus being from Graham, Wash. He is savvy and has great size, ready to cause fits for defenders. Jackson comes out of Phoenix and had Oregon in his top 4 list at one point. Getting one or both of these true offensive linemen would be huge for Oregon. Although, there are three other offensive tackles that I like who would make great contributions to the line. Chuck Filiaga, Aaron Banks and Henry Bainvalu each have great size at the position. Bainvalu may have the quicker feet of the three, which tends to fit better in Oregon’s offense. Banks and Filiaga, who each recently visited Eugene, are big enough to just be walls that won’t allow the defense to get by. One more I need to mention because he officially visited already is Michael Richardson from Utah. Richardson has nice size and may be another that has been overlooked by recruiting gurus that have underrated him. Whoever Oregon can pick up in the next six months will be joined by two solid commitments of Alex Forsyth and John Vaka on the line. As mentioned above, there will most likely be some changes in the faces of the committed players for Oregon in the next half year. De-committing is very much a part of the world of recruiting, and the Ducks lost a few last year and are not immune. However, the opposite may apply when someone de-commits from another school to pick Oregon. 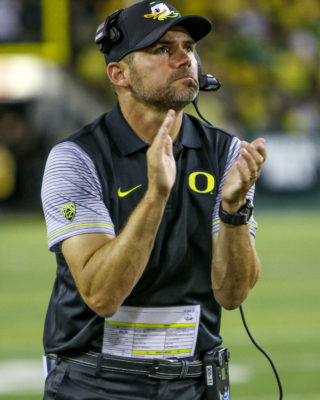 Coach Mark Helfrich needs to win the recruiting battle for the 2017 class. Recently, Isaiah Hodgins de-committed from Washington State and now taking a long, hard look at Oregon. Hodgins would be a welcomed receiver with all the recent question marks at the position. Oregon may hope to be able to flip athlete Connor Wedington from Washington, too. Wedington and fellow athlete, Salvon Ahmed, are two do-it-all guys that would definitely excel in the Oregon system. Wedington is so quick and fluid that the Ducks could turn him into a very effective weapon. Ahmed is my favorite athlete that Oregon has offered. His size and athleticism can put him in many different positions on offense or defense. An accurate evaluation by the Oregon staff of Ahmed could bring his game to an elite level, as Oregon utilizes versatile athletes better than anyone. Recruiting is like a fresh new relationship. It’s exciting and mysterious. It’s joyful and unreliable. It has highs and lows. The future is unpredictable and it constantly changes. The positives outweigh the negatives and makes it all worth it each time. I’m hoping that Oregon gets invited to the wedding the first Wednesday in February in 2017 by hitting a home run into the top 20.